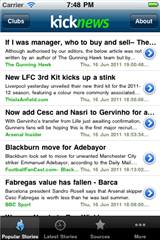 Kick News is a football (soccer) news reader for the iPhone. We gather the latest stories from from a large number of sources and using our unique algorithm, you can see what stories are currently popular. 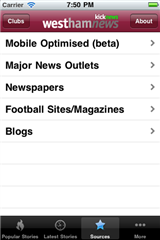 Just like this website (http://www.arsenalnews.net) you can view the latest football news from all over the web, but in a dedicated iPhone app, fully customised for your club, making it much easier than ever before to access the news that matters, wherever you are. Clicking on any story in the list, you can view the story directly from the app with the built in web-browser, making it easy to return to the story index at any time. 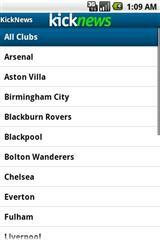 We also include the latest scores and league table. 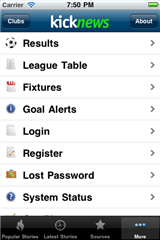 We have dedicated club editions on the App store as well, which don't have any adverts in and include live Goal Alerts. 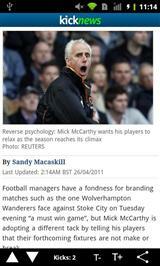 View on Apple's website and download for FREE via iTunes. We've also worked hard on our Android version and we're very pleased with it. Download it from the Android Market. If you like it, please give it a review. We really appricate your support. View on the Android Market and download for free.